Living in San Diego I was fortunate not to experience the brutal winter from which my Midwest and East Coast friends are still recovering. However just because we don't get a real winter doesn't mean we don't appreciate spring when it finally arrives. 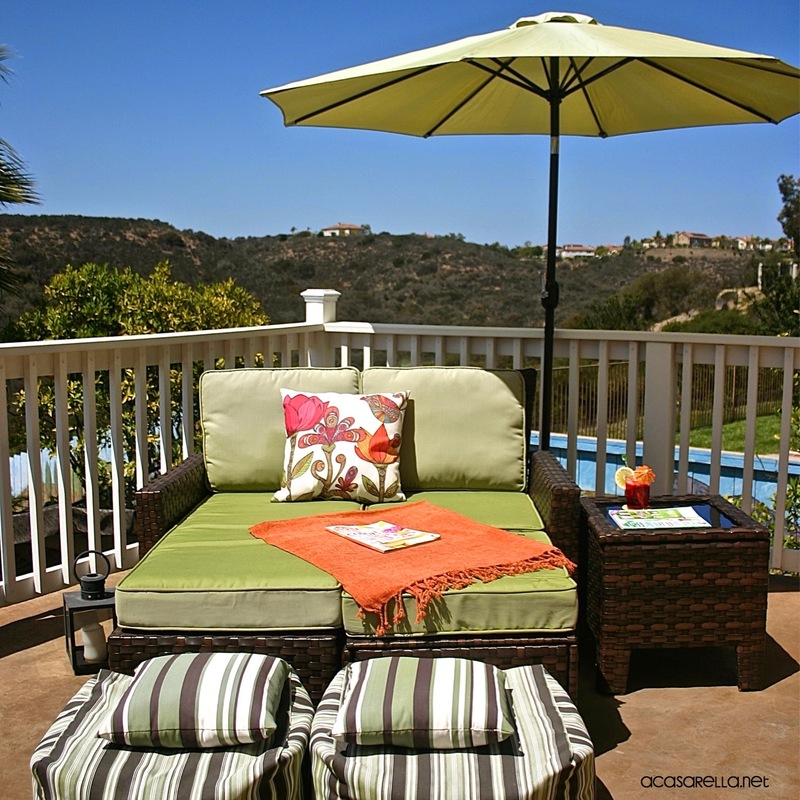 Spring, like nothing else, beckons me to our outdoor spaces--particularly our master balcony. Only this year, when I finally got out there, I was kind of underwhelmed. Don't get me wrong, I love my balcony. However, several years after purchasing our outdoor furniture, it was starting to look a little sad. Well, brown and green, but still not very exciting which is why I was so pleased when Wayfair.com invited me to participate in their "Pop of Color Campaign". Now $100 is a very generous stipend, but it wasn't going to buy me a new patio set. 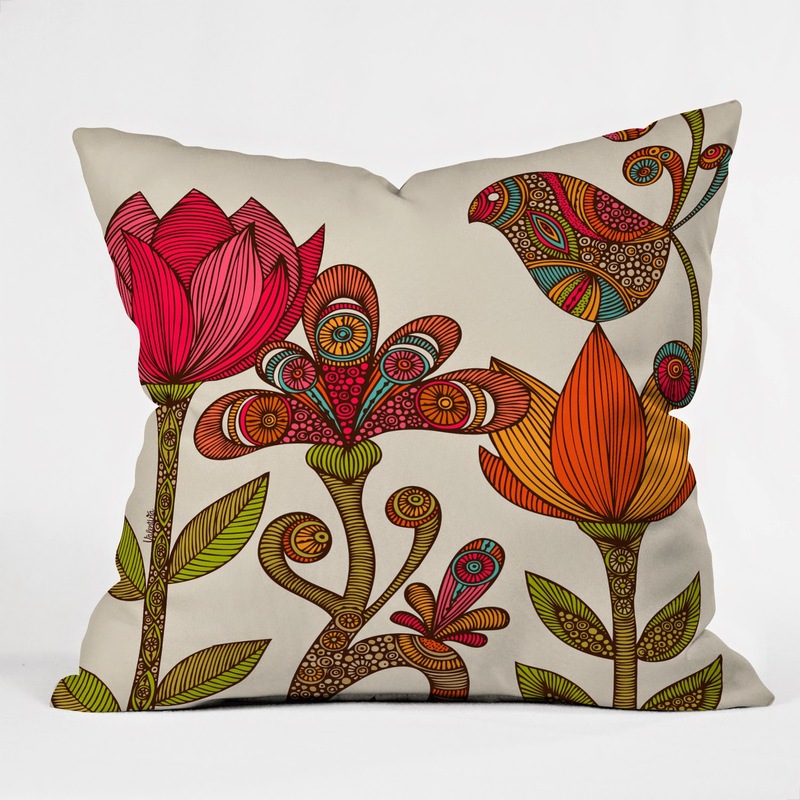 Therefore I decided to jazz up my existing furniture with decorative accessories in bright colors and fun patterns. My first stop was in the outdoor pillow "department" where I was immediately drawn to these fun, city-themed pillows. Having lived in all of the locations represented below, these were very tempting indeed. 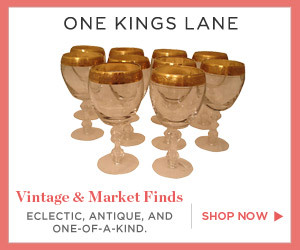 I was so glad that Wayfair.com allows you to "favorite" items because it enabled me to "wander" the site without worrying that I would never find them again. The only thing that stopped me was my decision to move away from the blues and greens. I figured if I was going to do this thing, I was really going to do it, so I started exploring more vibrant colors such as reds and oranges. I briefly considered dressing up the side table with a little tray and/or a faux flower arrangement and tossing a throw blanket over the cushions (for chilly evenings on the balcony). 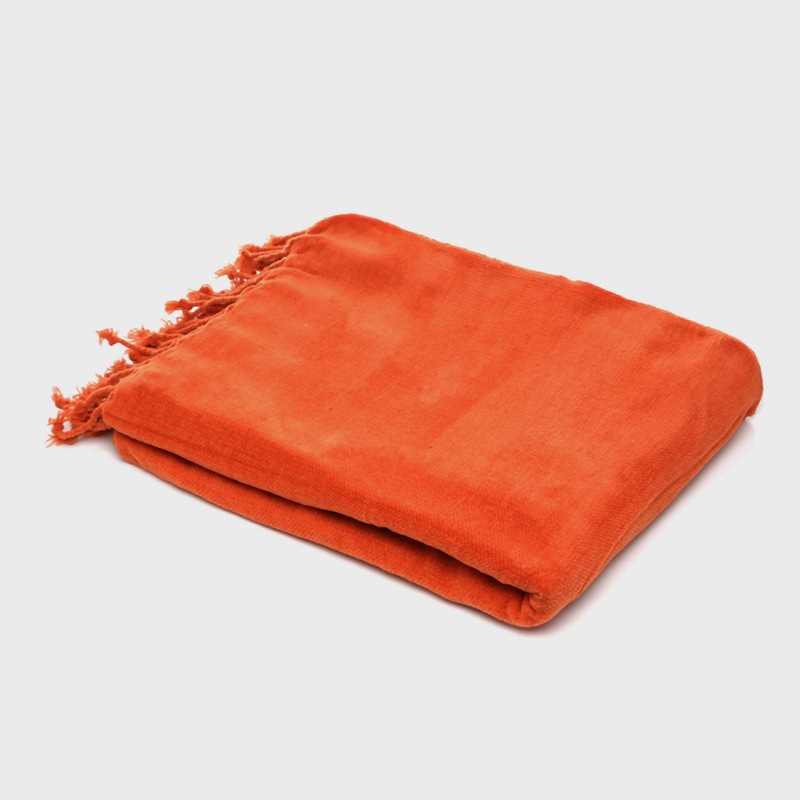 And in the end, I did go with a throw, but a solid one in a sumptuous orange chenille. Technically it's not an outdoor blanket but I will keep it in a little basket in my room when it's not being put to use outside. I paired it with this pillow and I am o-b-s-e-s-s-e-d! 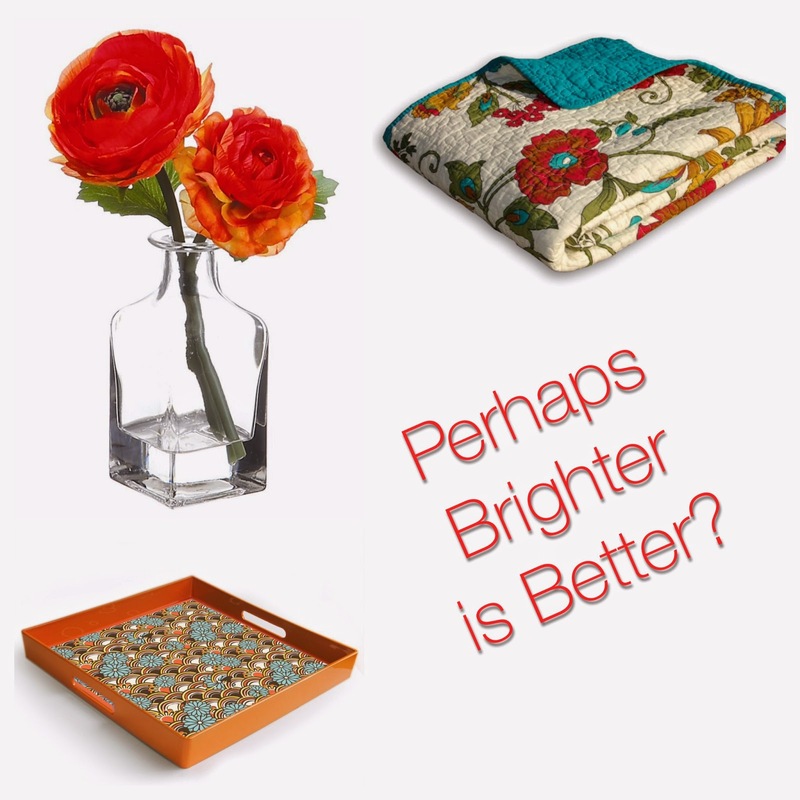 The pattern is so bright and fun; I definitely achieved my goal of livening the place up, don't you agree? Now I know what you're thinking, "Why does she have all the luck? Why can't I get $100 to spend at Wayfair?" Well settle down friend, because now it is your turn. Wayfair has generously offered to provide one of my lucky readers with a $100 gift card to their amazing site. 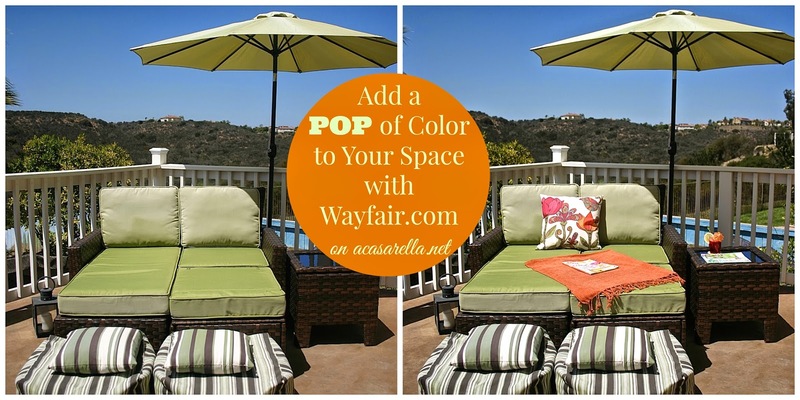 Simply follow the directions in the Rafflecopter link below (be sure to link to a Wayfair product in your comment) and you too can add a pop of color to your space! I adore my Kitchenaid but would love to upgrade to one of those! Love, love, love Le Creuset! I would totally by this http://www.wayfair.com/Skyline-Furniture-Tufted-Linen-Storage-Bench-7125STLNN-SKY4084.html . It's perfect for my bedroom because i could sit on it to get ready and put shoes on but then i could also store things in it, out of sight! My favorite thing about this contest is seeing what you all find on the site. I *love* these!! There is SO MUCH to love on their website. *SWOON* I really like the city themed pillows. A LOT. We are a military family and move around a lot. I love to have a little something from each place that we've lived. THIS would be a fun and colorful way to achieve that! Thanks so much for the chance to win! What fun! I'm trying to spruce up my patio. You have inspired me. I would be shopping for some pillows and outdoor decoration. I love your patio! I'd buy some of the items here http://www.wayfair.com/Elegant-Home-Fashions-Dawson-4-Piece-Bathroom-Set-Dawson-4-EHF1105.html and add some storage to a certain teen girl's bathroom because there never seems to be enough. Thanks Marie! And I hear you about the teenage girls. They use up that storage as fast as I create it! 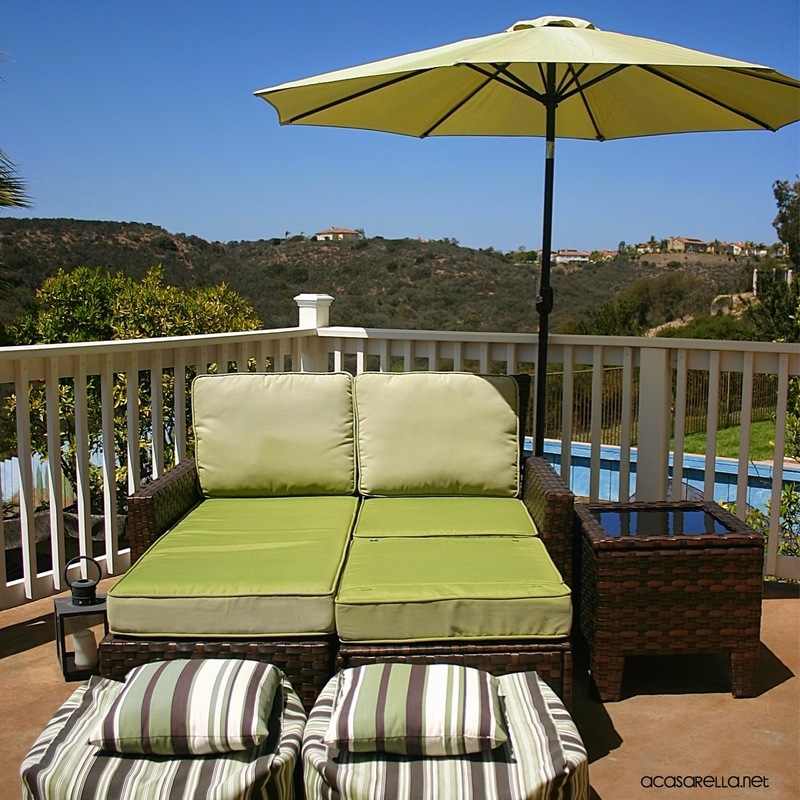 Your pop of color really added to your patio set! I've been wanting to repaint my living room, so I could use that $100 for some fresh artwork for wall decor and maybe some new throw pillows to add my own pop of color. Thanks for this awesome giveaway!!!! And I'm just crushing on your porch! ;) Thanks for stopping by, Linda! I would love to get anything to make my living room a better living space!! I am sooooo bored with it!! 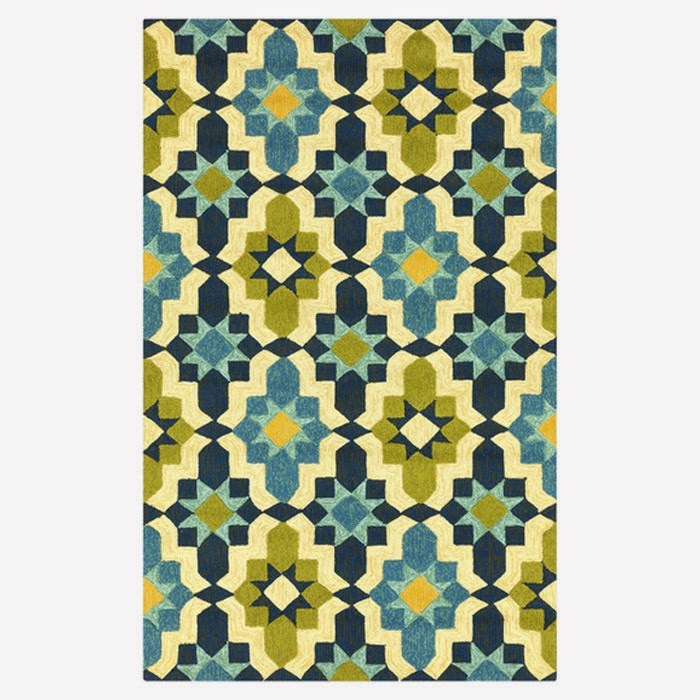 I love this rug so much! I want this so much it makes my teeth hurt! Visited the site and I really like the Hinkley Lighting Congress 1 Light Wall Sconce. Its so modern! Oh, that is really cool! I'd basically take one of everything you showcased...Love the pops of color you added to your balcony. When can I come visit? Well, let's just start of with there are too many wonderful goodness on the site! My husband and my favorite are the chic home bliss garden and the allison quilt set for our bed. We are in need for change and something more vibrant and inviting. Thanks for sharing! The patio looks awesome! Jazzed up vibrant colors are perfect for this time of year! That is beautiful. I am really starting to love Navy blue and need to find ways to incorporate it into my decor! Your final picks look gorgeous. Green and orange always say "here comes summer" to me. Although I must say, I would be sooo tempted to buy the city-themed pillows!! I loved all of your options. I would have struggled to choose. I would put this towards a storage bench for our mudroom. Not the most exciting, but very functional. I have those and I *love* them! I got rid of all of my plastic tupperware awhile back and replaced it with these. No regrets! I came sooo close to buying that one! Holy cow, that is a good price! Good find!! 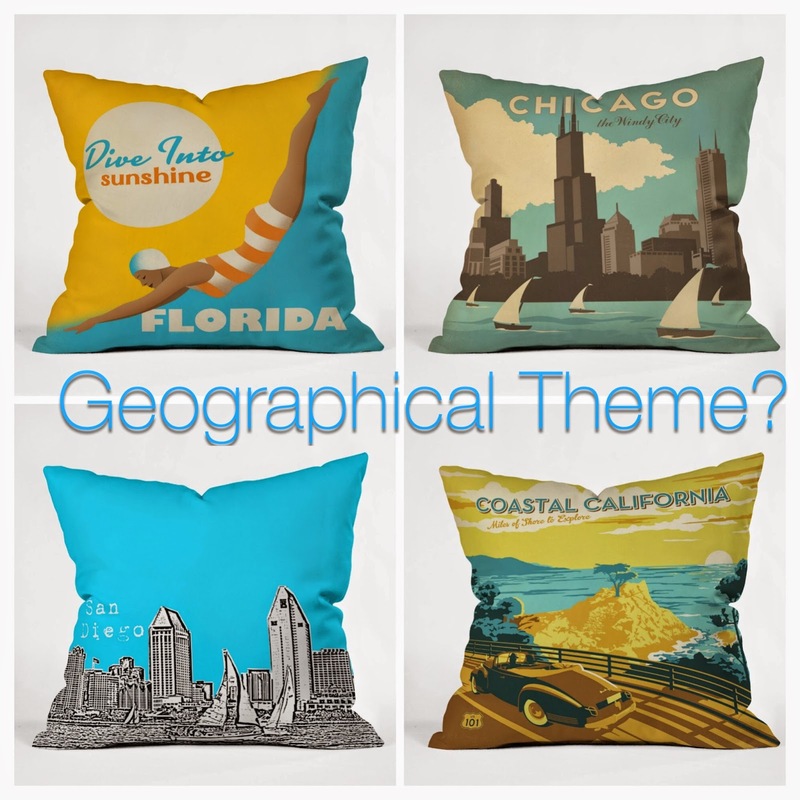 I am *still* thinking about those geographical pillows. May need to go back for those! I really like the Surya Intersecting Lines pillow, it fits my room perfectly. I would get the 5 qt saucier with lid. 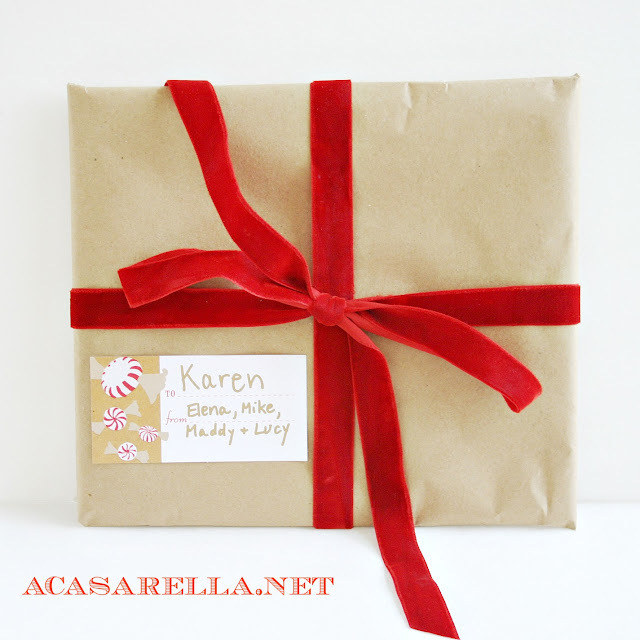 Just found your beautiful blog via 5 Minutes for Mom!! My DH and I were out in San Diego for the first time last year and LOVED it!! I love Wayfair and to pick one thing I'd buy... hmmm.. I"m in need of a new wafflemaker. Grey and yellow is one of my favorite color combos! That's a great price for a set of two! I could get lost on that site for hours. I like this copper fire pit set. My husband and I have been talking about getting one of those, Good find! Aww, you guys with the crib stuff are making me miss those days when my kids were babies! I like the United Curtain Co. Monte Carlo Single Window Scarf, they are perfect for my livingroom. Ooh, I actually have a good spot for one of those. Nice find! How pretty is that? It has sort of an Indian feel to it. Love! I'd get a storage shelf system, I love this one http://www.wayfair.com/Winsome-Terrace-4-Tier-Storage-Shelf-92429-WN1742.html it'd be great in my son's room. I might need to get that in white! OMG where to start? I want so much! Love what you did with your porch. I think my back yard needs some color, too! 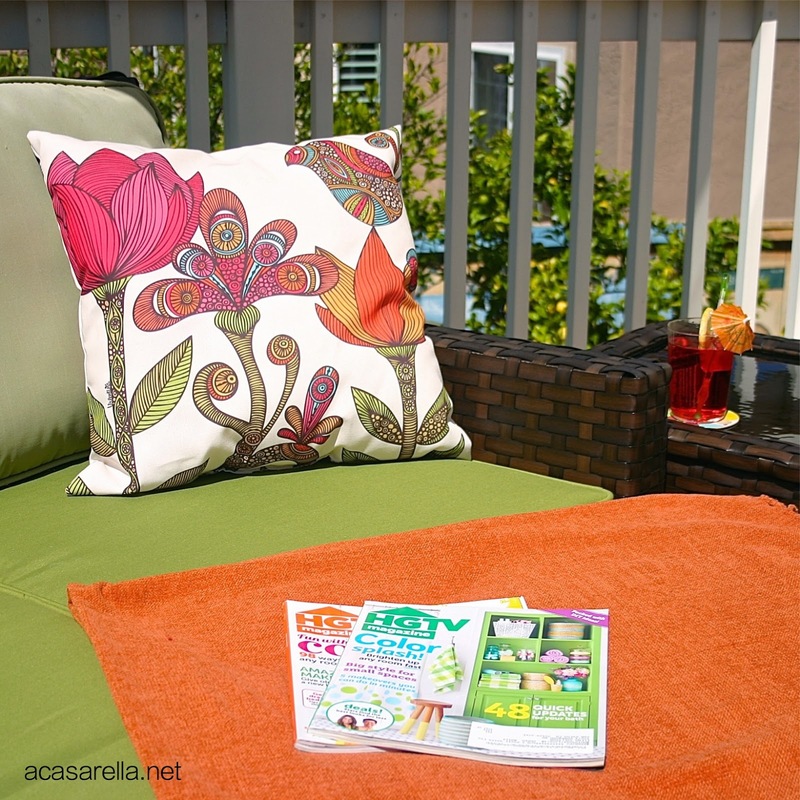 Your pops of color really make your balcony seem like a happier place -- your balcony is already pretty awesome, BTW! I would buy some new pillows! I want a French Press! I have found a wonderful product but need a French Press to brew the Choffy!